Mr. Lamshed's class in Adelaide, Australia is reading Holes at the same time we are. 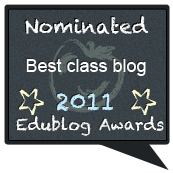 We are going to do something different and post on his blog for this assignment. He has 3 reflection questions over chapters 1-7. 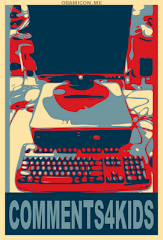 I want you to choose one of the questions and leave a comment on his blog. Make sure you use correct grammar and punctuation. 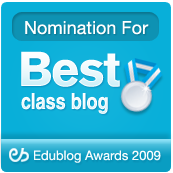 Use your first name only and add the address for this blog so they can track it back. Today I am particularly pleased to be reading some of Part 3 of Encounters with the Archdruid by John McPhee to my class. We have been studying water all year and now we are talking about dams. The section I am looking at today introduces the students to David Brower, Floyd Dominy, and their meeting where they discussed the damming of Glen Canyon. This excellent narrative describes two very powerful and influential men disagreeing over the need for the dam to be built. Dominy loves building dams, while Brower believes all dams are bad. The purpose of this lesson is for my students to see both sides of this issue and to help them think critically about how we should solve problems. It is important to be reminded that there are always more than one side to any issue and that being able to examine both sides can usually help create an acceptable solution. I would highly recommend reading this book. Not only is it very informative about the most important early leader of the conservation movement(with the possible exception of John Muir) , it is also a wonderful example of narrative prose. If you are interested in reading this book, here is the Amazon link. Here is the link to the post if you are interested in reading the rest of the responses. 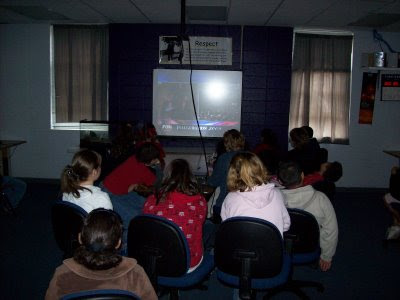 During my teaching career I have had many shared experiences with my students. I was in class the day one of my students was accidentally killed by his brother in a hunting accident. I was in class the a former school student that was helping coach basketball was found dead in her bed. I was in class the day of the space shuttle Columbia tragedy, and of course no one forgets September 11, 2001. These were, and still are defining moments in my teaching career. They also happen to be extremely sad events. That is why this presidential inauguration was so wonderful. Regardless of your political leanings the simple fact that 45 years after MLK's "I Have a Dream" speech resonated throughout our country a African-American was elected President of the United States. There are so many sad shared experiences that I have with students that something this positive uplifts me. I am quite aware that many of my , if not all, don't truly understand the incredible event that took place yesterday. At 39, I don't truly understand exactly what it means. I grew up during a much more tolerant time than those older than me. I watched the Cosby Show on television and listened to rap music in high school. I do know that my students will be able to look back at this event when they are older and will be glad they had this experience. It was wonderful to have a good shared experience with my students for a change. 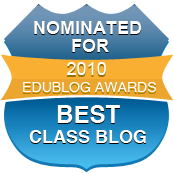 Here is a link to Education World's Inaugurals of Presidents of the United States: Some Precedents and Notable Event. Here is the link to the Inauguration Trivia Hunt. Today is Martin Luther King, Jr. Day. Since this is the day before the inauguration of the first African-American President, how has the country changes since this speech was given 45 years ago? We have started reading the novel Holes by Louis Sachar. We will be focusing on character development and plot throughout this novel. We also will cover setting to help keep track of the time shifting elements. This is one of my favorite books to teach and I am really looking forward to the next few weeks. We will be posting information about the story on our blog A Novel Approach to Reading. Here is Megan putting in editing marks for our DOL. I have modeled how to do this for a semester and now I am allowing my students to do it. I have two reason, one is to see if that student understands how to do the work and the other is so that the students can learn from someone other than myself. These are students that had a good week last week. It is important we recognize solid behavior by our students. In Investigate 3 we created a model of erosion, but this time we added a few large rocks to represent hills or small mountains. 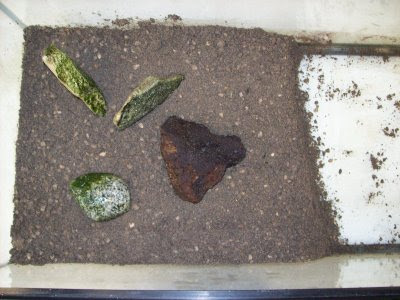 The picture shows the layout of the rocks before the experiment. The students had to create a map showing the rock placement before the experiment. Here is the experiment. Notice that the erosion this time was much more focused along a single path, and the water eroded much more of the soil this time. Unfortunately, I did not manage to make the soil as flat this time as the last and that did help guide the water, but it is a mystery why there was so much more erosion. Do you have any ideas why this happened? At the end of the demonstration the students were required to show the flow of water on their maps. Can You Predict 50,000 Hits? We had our 40,000 visitor to the blog yesterday. We had our 30,000 visitor on October 1. Use this information to predict when the blog might hit 50,000. 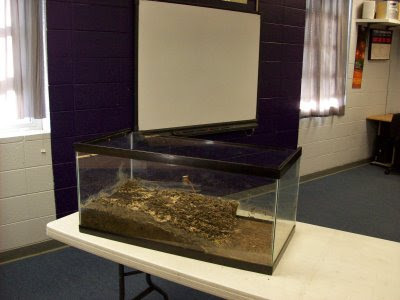 This is the video that I created for our demonstration of erosion. After our class discussion, comment on why the humus and clay seemed to erode more than the sand and the gravel. You may want to look at the model again. 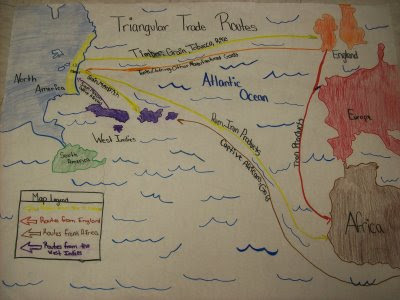 Here is our round-table discussion of the Triangular Trade project. I asked the students several questions to find out what they had learned from the project. Please note, they did the project before our winter break and only had a few minutes to review what they had learned. Students used the internet and textbook to explore the Triangular Trade that took place between Europe, the Americas, and Africa. They identified the objects (and slaves) that were traded along the route. 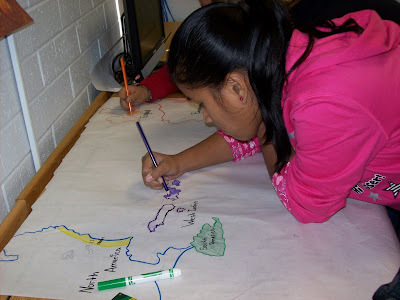 Next the students created maps that showed the routes and the items (and slaves) traded. Here is a finished map. The students only spent two days on this assignment, only a few hours total. 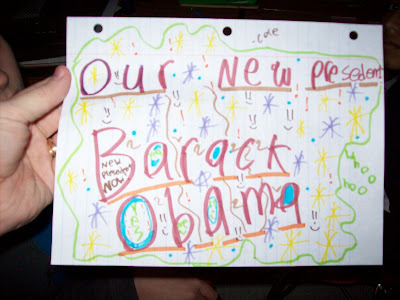 Students can create content that reflects important historical information in an appropriate form rather quickly. This short video shows art work done by Anderson Elementary's 3rd grade. This activity was part of their science kit on motion. Art is a great extension of any core curriculum subjects! Even though it is impossible to read, the students wrote about their art. They described shapes they saw in their work. Some of the writing was quite descriptive.